I'm not sure calling it a church is quite accurate. It's a bit more like a shrine, with as small room that could hardly hold four people, a number of candles, sticks of incense, rosaries, pictures of the Virgin Mary, Jesus and presumably Saint Ilias himself (Elijah, I believe). His claims to fame appear to include raising the dead, bringing fire down from the sky and disappeared under supernatural circumstances, per Wikipedia. But I knew none of this when I was in Athens last July. I was fresh from my time in Africa and a vacation in Zanzibar and adjusting to the relative Western normalcy of potable water and non-malarial mosquitos. 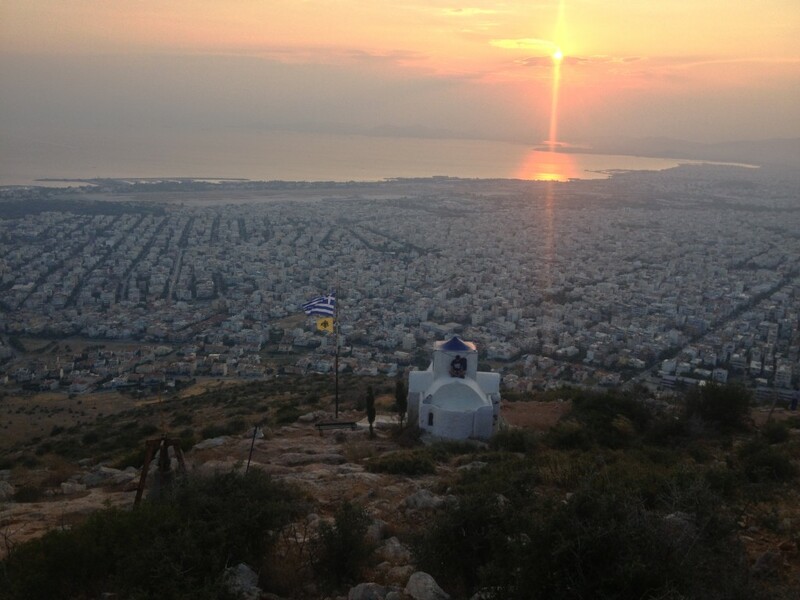 I was staying in Glyfada with found myself drawn to exploring the giant hill behind the neighborhood when I'd go out wandering in my free time. The acropolis and ancient Greek ruins were wonderful and lovely, but seven months into traveling alone I'd come to learn I'm happiest wandering in quiet places. My wonderful hosts noticed I liked to go walking and pointed out a string of lights one evening that switch-backed up the side of the hill. They explained that at the top was a little shrine, and that the path was to be illuminated for the week in honor of some saint or another. "We like our saints," she informed me (( Another favorite anecdote from this host, when asked about the difference between Greek Coffee and Turkish Coffee: "Greek coffee is really just Turkish coffee... But we baptize it." )). As it turned out the last day it would be illuminated happened to be that night, so I made haste to find my way up there. Dead reckoning had served me well in traversing the sometimes confusing neighborhoods in Lima and wandering much-too far from Casapueblo to Punta del Este in Uruguay, and here it helped me find my way through the dark, unfamiliar neighborhoods and towards the string of lights leading up the path. Calling it a path is a bit generous; they were poles with strings of lightbulbs that outlined piles of rocks and stones that were flatter than some of the surrounding ones, though at no less steep an incline. After 30 minutes of following a caravan to the top we were blessed with a beautiful view of the city at nigh and the summer sky, perfectly clear and sprinkled with stars. It was lovely, and though the path was not lit or really even properly outlined in the same way, I'd return and make the hike several more times during my month-long stay. Each time I went a little bit higher, past the shrine and deeper in the hills, wondering what was on the other side. Coming back from extended meander in which I climbed the hill about as high as I could go before things devolved into actual mountain climbing, I stopped to take the photo above. I sat and watched the sun until most everyone had left, taking in the silence. It was just me a woman. As we both rose to leave at the same time, she approached me to ask a question. She asked first in Greek, as most people assumed I was Greek. leading to the amusing exchanges I'd grown used to (( At my favorite souvlaki place, the gruff, older man who was always there stopped and stared at me one time while my order cooked. "You... You are Greek people," he said. It was not so much a question. At an ice cream place I'd been allowed to cut in line to expedite things, as the English-only family in front of me were taking a long time. I was promptly sent back after a laugh when they realized I too spoke no Greek. )). So she tried in English. "Can you go in there and blow out the candles?" She said, motioning to the shrine. I had not actually gone in the shrine at this point,despite having walked up to the point several times now. The request seemed odd, like something you really shouldn't do at a shrine that isn't yours. I also wondered why she wouldn't just do it herself? Sensing my hesitancy perhaps she said, "I cannot do it because I am a woman. Woman are not allowed in the shrine. No one is here. I worry that it might burn without people around." This made more sense so I obliged. I took a moment to take in the incense, look at the rosaries, candles floating in water and other shrine-like things you'd expect. Places of worship do not hold special significance for me, but there is something I like about them. They are generally quiet, reflective places. Like little libraries where instead of books you're left with your own thoughts. I welcome such environments and try to be appreciative of them whenever I find myself in one. I took my moment, blew out the candles for the shrine of Agios Ilias and made my way down the hill.